According to Mr. Paul Kanjanapas, Managing Director of IMPACT Exhibition Management Co., Ltd., the operator of IMPACT Exhibition and Convention Center, known as IMPACT Muang Thong Thani, apart from being a MICE venue, IMPACT also provides one-stop service for business and incentive travelers with two international-standard hotels, tourist attractions, places of interests, retail shops, restaurants, and outlet stores of leading brands located in the same compound, offering a convenient one-stop destination for shopping, dining, and leisure. IMPACT Exhibition and Convention Center, Muang Thong Thani was established in October 1999 by Bangkok Land Public Company Limited and managed by IMPACT Exhibition Management Co., Ltd. In 2014, the Center was acquired as underlying asset of IMPACT Growth REIT. The Center is regarded as the largest exhibition and convention center in Thailand and Southeast Asia with over 140,000 square meters of indoor space comprising four building, namely IMPACT Arena, IMPACT Challenger, IMPACT Exhibition Center, and IMPACT Forum, and 137,000 square meters of outdoor space. For utmost comfort and convenience of customers, IMPACT has adopted technology in accordance with the Thailand 4.0 era, enabling customers to access information about the Center anytime, anywhere on their mobile devices. Customers can stay connected with IMPACT through different social media channels or explore all 55 function rooms in 360 degrees on Google. 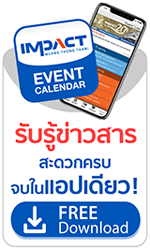 There is also IMPACT Event Calendar mobile application that provides a list of events being held at the Center, directions to event venues, a feature to find public transportation, available parking spots, real-time traffic report, and special promotions and offers from participating shops and restaurants. As part of its 20th anniversary celebration and “IMPACT Touching Heart Sharing Love” project, IMPACT plans to donate 20 million baht to support the purchase of medical equipment and charitable organizations relating to nursing, education, and community wellbeing throughout 2019. With its strong commitment to developing and providing facilities and services to support business growth and maintain its position as a one-stop MICE and tourist destination, IMPACT is confident that it will be able to secure the largest market share of 62% and the overall business in its 20th year will continue to grow and prosper. IMPACT is also committed to promoting sustainable growth of Thailand’s MICE industry and tourism sector.